The color green helps keep you relaxed and stress free and we could certainly all do with a bit of that in our lives! Green reflects nature and gives us a sense of calm, so why not add this serene color to your world and accessorize yourself with a wonderful pair of green earrings. With a stylish pair of green earrings you can add an elegant touch of color to your wardrobe and give yourself a sparkling new style. Green earrings will also help bring out the colors in your eyes, giving you a beautifully radiant look that everyone will be envious of. Go for a glamorous look or a subtle one, but you know you’ll be able to find that great green hue that’s just perfect for you. To help you on your way to being suitably adorned and radiantly relaxed, here are 8 green earrings you will love. If you’re looking for an exotic piece of jewelry that will look fabulous with any wardrobe, then these stunning green snake earrings from Navachi could be just what you’ve been searching for. They’re super stylish and will keep you right on trend through any season. These gorgeous green earrings feature a green simulated cubic zirconia crystal carved into the shape of a teardrop, with a gold plated snake design wrapped around the crystal and attached to the clear crystal at the top. 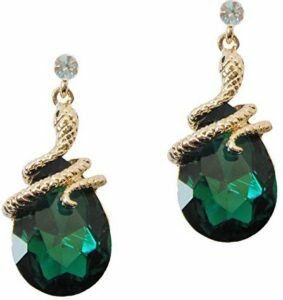 The green crystal is set on a yellow gold plated background, to match the color of the snake, and the backs of the earrings are plastic discs, which helps them stay on your ears securely. These dazzling earrings measure just over an inch and a quarter in length, meaning they’ll stand out when you’re wearing them, and you know you’ll have all your friends commenting on them! These fantastic earrings would be ideal for anyone who loves a little bit of fantasy in their world, as they have a mystical and magical look about them, which adds to their appeal. They’d look brilliant with other snake themed jewelry but they could also stand on their own, giving a fabulous touch of color to your wardrobe. They’re stylish enough to wear with a range of different styles, and they’d look extra glamorous with a more formal outfit. Now, who could resist having a little fairy hovering around! With these fabulous green earrings from DianaL Boutique you can have Disney’s Tinkerbell flitting around your ears all day long! These gorgeous earrings feature a rhodium plated metal crafted into the shape of the little fairy, Tinkerbell. 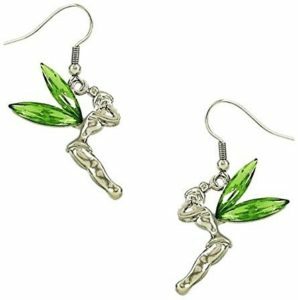 Tink’s wings have beautiful little green rhinestone crystals, which give added sparkle and will reflect the light brilliantly as she dangles from your ears. The earrings have silver tone fishhook backs, which match Tinkerbell’s body and they measure just over an inch in length, so everyone will be able to see these detailed little earrings when you’re wearing them. These cute green earrings would be a great little accessory to add a fun and flirty element to your wardrobe. They’ll add a wonderful touch of color and will let you show off that vibrant personality of yours. They are a beautiful pair of earrings for adding a little bit of fairy sparkle to your world and are ideal for bringing a touch of Disney magic to your casual wardrobe. They also come in a little gift box, so they’re all set to go to Tink’s number 1 fan! So, you’re looking for something that will add a little bit of color but will still be chic and stylish. Well, these stunning green earrings could be just what you need. They’re fashionably elegant and they will add a delicate touch of color to anything in your wardrobe. These gorgeous green earrings feature a sparkling green rhinestone crystal, that is circular in shape and flat at the back. 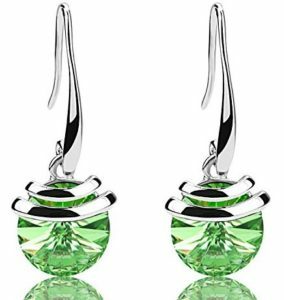 The green crystal dangles from a silver tone fishhook and has a silver tone metal ringed design layered over the crystal, giving the earrings a contemporary look. These earrings will dangle from your ears and will be sparkling in style at all the best events, with them measuring just over an inch and a quarter in length and around half an inch wide. With their dazzling green crystals, these earrings are the perfect accessory for any chic occasion. They will bring a sparkling touch of color to any wardrobe but will be particularly suited to a more formal style. These fabulous earrings will look superb with a spring or summer dress and they’ll also add a beautiful pop of color to a winter wardrobe. They really are multi-seasonal and super versatile, and they even come in a cute little gift box! If you want to dazzle by day and night, then these sparkling little gems are precisely the piece of jewelry you’ll need. These stunning earrings will add a fabulous pop of color, as well as a rich, stylish touch to practically anything in your wardrobe. These delicate green earrings feature a simulated emerald that is princess cut and in the most luxurious shade of green. The sparkling solitaire crystal is set in a polished sterling silver, giving the earrings a modern and elegant look. The earrings have sterling silver friction backs, so they’ll stay nice and safe on your ears, which is handy if you’re wearing them everyday. These adorable earrings are delicate and dainty, and measure just a quarter of an inch wide, so they’re the ideal size for wearing all the time, no matter where you venture. These green earrings will look chic with any outfit, as they have a classic style that is timeless, so you can dress them up or dress them down and you’ll always look sophisticated. They’d make a fabulous gift for anyone who loves delicate jewelry and they’re a fantastic way of getting that emerald gemstone look without shelling out for the real thing! These would be a great piece of jewelry for wearing to work or school and would also shine brilliantly on any special occasion. They’d also look cute with a little emerald necklace; genuine or not! So, you’re looking for that special piece of jewelry that will stand the test of time and dazzle the night away. Well, look no further, because these glamorous green earrings could be just what you’ve been hoping for. 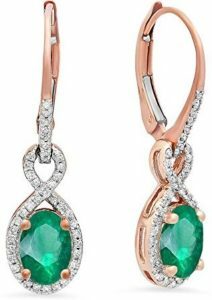 These stunning earrings feature a genuine oval emerald in a rich shade of green, set in a beautiful 10 carat rose gold. The radiant emerald is surrounded by genuine white diamonds that loop around and into an infinity symbol just above the emerald. The diamonds continue onto the bottom of the rose gold loop that links into the leverback of the earring. These gorgeous earrings measure just under an inch in length and around a third of an inch wide, meaning they will look dainty but dazzling on your ears. They are the ideal piece of jewelry for a special occasion and will look super chic at a formal event. The rose gold gives the earrings a contemporary look that will look fabulous with other trendy jewelry. These earrings will sparkle and stand out no matter what you’re wearing but they’ll look extra sophisticated with a gown or dress for a party. They would also make a stunning gift, especially for anyone who has a May birthday, with emerald being their birthstone! These earrings have a timeless style and with the genuine stones, you know it will be your go-to piece forever! If you’re in need of a dazzling pair of earrings that you can wear with everything in your wardrobe, then these gorgeous little green earrings will be right up your street. They’re stylish and modern, and will add a fabulous sparkle to anything you wear. 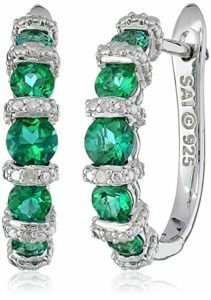 These beautiful hoop earrings feature green created emerald stones interspersed with genuine white diamonds, which gives a splendidly sparkling effect, as they are multi-faceted to catch as much light as possible. The stones are set in polished sterling silver, which gives an extra radiant look and adds to their luxurious appeal. The earrings will stay put on your ears with the click-on leverback closures and the sterling silver means they’re safe, even for sensitive skin! These glamorous hoop earrings are dainty and delicate, so they will look so good with both casual and formal styles. You can wear them to work to brighten up your day and wear them when you head out for a night on the town! They’re a great way of adding a glitzy pop of color to your world and they’re so chic they’ll go with anything! They even come in a pretty little gift box, which is ideal for storing them in if you don’t want hand them over as a gift! Have the luck of the Irish with you wherever you go, with these fabulous green four leaf clover earrings from Cocojewelry. They’re the ideal little accessory to give as a gift for anyone who needs a bit of luck in their life. These brilliant bright green earrings feature a silver tone stud carved into the shape of a darling little four leaf clover, with heart shaped leaves. 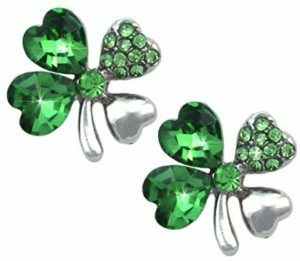 The clover has one leaf that’s encrusted in little round green rhinestone crystals, two leaves that each have a heart shaped green rhinestone crystal and one leaf that is the shiny silver tone metal to match the little silver tone stem. The center of the clover also features a round green rhinestone crystal that adds even more luminosity to the earrings. These adorable stud earrings are dainty and cute, measuring just around a third of an inch wide and long, and have plastic disc backs, so they’ll stay safe and secure on your ears. These sparkling green earrings would make an ideal piece of jewelry for wearing if you’re heading into an important exam or sitting your driving test, or just if you need to have a little bit of luck on your side. The green stones will add a wonderful splash of color to your wardrobe and their small size means you can easily wear them with a range of styles and other colors. They’d also make a trendy little gift for a graduation present and for anyone who’s off to pastures new! 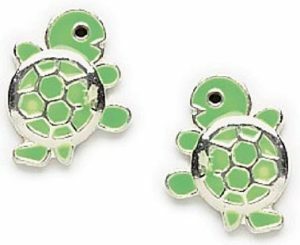 Now, how can you possibly resist these adorable little turtle earrings! They’re fun, fashionable and extra cute, and they’re perfect for adding a bright and colorful touch to your wardrobe. They’re also a great way of showing off your nature loving personality! These gorgeous little green earrings feature a sterling silver stud carved into the shape of a darling little turtle. The turtle is covered in a shiny green enamel, with silver detailing to highlight the shell. These fabulous little earrings measure just a quarter of an inch wide, so they’re ideal for wearing everyday, when you just want a casual pop of color to jazz up your wardrobe. The earrings have little sterling silver butterfly friction backs, so they’re safe for sensitive skin and will stay in place all day long. These cute green earrings would look great with casual styles, and they’re a fabulous way of bringing a little bit of joy and good cheer to your day! You’ll certainly cheer everyone else up when they notice these little turtles! They would make a fantastic gift for both adults and kids and they come in a beautiful little craft jewelry box, so you’re halfway there with the wrapping. What’s more, the company also donates a portion of their proceeds to animal conservation groups, so you’re also helping to protect nature every time you buy a pair and are doing your good deed just by wearing them; awesome!